My Wardrobe doesn’t just get bloggers; it positively embraces them. Over the past two months they’ve held two events for bloggers, both of which were as good as anything I’d ever been to with the day job. No shunting you out into a crap bar with no free booze or seats or snacks or PRs for these guys, no sir! Earlier this week Laura and I paid a visit to My Wardrobe HQ to browse the sale goods, look at next season (I still have a million photos from the press event months ago… doy, where’s the time gone?) and have a chat with the mighty Susannah, the woman responsible for getting bloggers on board in the first place. Unfortunately my new job in the middle of nowhere meant that I was a little late, so I didn’t have time to take too many pictures. Arriving late, sweating like a dog… I didn’t want to be even more annoying, you know it is. 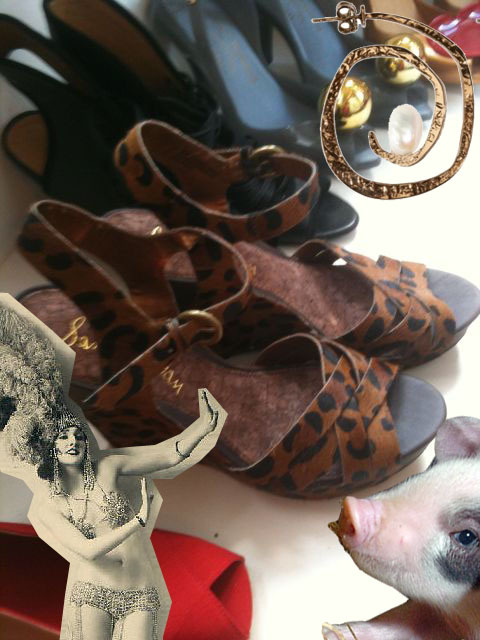 I did, however, manage to take three pictures, which on reflection represent my love for a certain type of animal print. Hmm. To make up for the lack of decent images, I thought I’d show off my amazing design skills. There’s more of that in my portfolio, you betcha. This Sonia Rykiel is last season and now in the SALE. I had swooned over it on numerous occasions and was even more impressed in the, uh, flesh. It’s a lot longer than this jaunty image makes it look – the sort of length that even grandma me would wear. The zip is really nice too – obviously it’s a great detail, but I remember making something similar at college and the zip cutting my neck to shreds. Needless to say, Sonia’s does not do that. *Edit: The dress is sold out now, but you can get the bag or a stripey version. Or, ehm, buy it ASOS. Hmm… how could you make fashion’s favourite controversial footwear even more so? 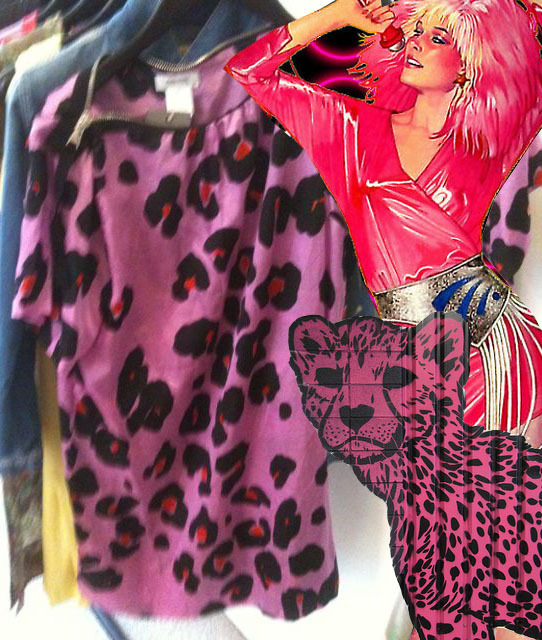 Make it animal print? I guess if you’re not sold on clunky, ugly sandals (aka, the best kind), a layer of leopard print isn’t going to change anything. 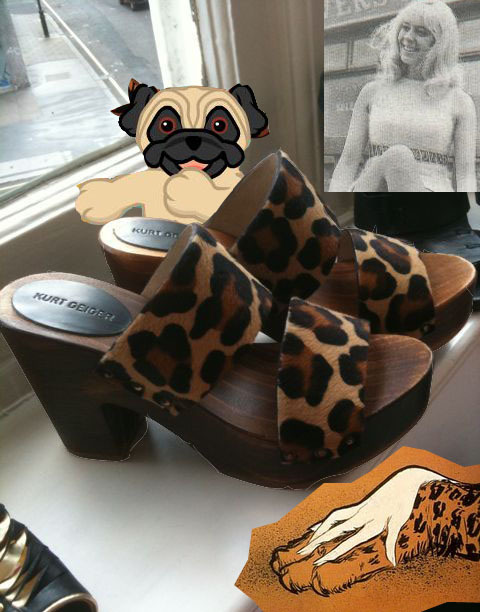 This Jada clog from Kurt Geiger is my dream fusion of chunky, wooden sole and pony skin upper in an animal print. Swit swoo. I wasn’t aware of Sam Edelman until this week, but I think these shoes are actually my favourite thing I saw at My Wardrobe. The Katrice Leopard Wedge is a really appropriate height (how boring, sorry) and is really beautiful Gloucester Old Spot kind of leopard, not an out and out trashy leopard. They’re in the sale too, but there is just one pair left, size IT39. Any takers?